For me, loyalty, customer service, and value are paramount. Apparently, these principles are not important to all Miami businesses, at least not to some indie businesses in Miami. Why is customer service a struggle? 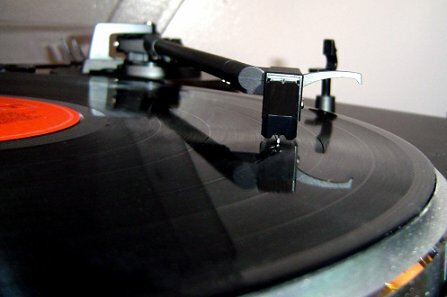 Today is record store day, but the only think playing is my anger, like a broken record. Photo used with permission. I slept on the idea of posting this article for a long time. In general, I prefer not to post negativity, but I feel deeply offended and want to vent. What was once my favorite local, indie business in Miami has failed me. I believe in loyalty. I also believe that in a down economy consumers have less to spend, so businesses must work harder to gain customers' loyalty and money. Apparently, not all businesses agree, especially not local Miami businesses. At more than one Miami business where I used to be a regular, I've noticed a sense of apathy on the part of employees and actual disdain toward paying customers. Since Buddhist beliefs and veganism have become critical parts of who I am, I've greatly reduced my consumption. Nevertheless, I'm a strong supporter of the 3/50 Project and believe in buying locally, sustainably, and with compassion. I also believe in showing gratitude toward good businesses that provide quality goods and services, and I believe that businesses should show gratitude toward paying customers. It is this last idea that has caused a rift between me and some businesses that used to be my favorites. I was so in love with this store, but a lack of customer service and unappreciative attitude toward customers mean that I will never go back. This business is a very small store in a far neighborhood, but at one point I was going there a few times a week. Despite being small, and despite the fact that this store was rarely crowded at the times that I went, I always had to wait too long for service. On the first occasion when I noticed the lack of customer service, I was the only person in the store, and there were two employees who were playing on computers while I waited at the register. I learned from one of those employees that there is free Wi-Fi in the store. When I suggested that I might come there to work on my novel, she laughed at me and then complained that there are many customers who sit there all day. Don't businesses want customers anymore??? Another time, I had to wait in line way too long, with cash in hand, to make a simple purchase because the employees were having trouble ringing up a foreign customer. As I was about to leave, an employee said to the foreign customer, "Let me get her out of the way first," referring to me. I should have just walked out and never come back. I don't believe that businesses should think of customers as hindrances that need to be moved out of the way. I was put off by these encounters, but I still returned to the store several other times. The final straw for me was when I tried to redeem a Foursquare special. Granted, I am new to Foursquare, so maybe I don't understand how it works, but it was the store's attitude about the situation that completely alienated me. Up until I tried to redeem the special, I was unaware the store even knew who I was due to employees' complete lack of gratitude and acknowledgment. No employee ever introduced him or herself to me, no one ever addressed me by name, and no one ever bothered to tell me thank you for shopping there. I was so stupid because I spent so much money there. I'm not saying that employees had to grovel, but a "thank you" now and then would have been nice. So the special is one that is "unlocked every check-in" per Foursquare, but apparently that does not mean you can redeem it every check-in, as I was informed by a store employee. When I tried to redeem the special for the second time in two weeks, on my fourth paying visit to the store in the same amount of time, the employee informed me that I could not redeem the special because I redeemed it previously. I probably looked confused because of the "unlocked every check-in". The employee told me, "Remember, you unlocked this a few days ago? It's one per customer." Sadly, that was the first and last somewhat personal acknowledgement that I ever received from an employee. I said that I still wanted to purchase the item and was willing to pay full price, despite the confusion. Then she said that this time the item would be free, but next time I'd have to pay because customers couldn't be redeeming the special all summer and the rule was one per customer. I ended up looking like a scammer and a cheapskate in front of the other person who was with me. I was horribly embarrassed. The employee could have just given me the special when I first tried to redeem it, or she could have just accepted my offer to pay full price, but instead the employee insisted on telling me that I was trying to get something that I didn't deserve. We are talking about something that probably costs the store less than one dollar and brings in a revenue of no more than three dollars. The above is an example of a store cheaping out and losing out on customers. Every time I went there, I spent $15 to $20, and I was going there at least twice a week. $15 per visit x 2 visits a week x 4 weeks a month = $120 of my money going to that store per month. Maybe I'm not really angry at the store or the employees. Maybe I'm just angry at myself for being so stupid. So now, they get $0 per month from me because they embarrassed me over something that costs them less than one dollar. All they have to do is change the special to redeemable only once. I think they don't do that because they are scamming customers into believing that there is a special every time, when really, the special is only one time. Today is record store day, but I won't be attending; I've heard enough of the angry record replaying in my head. I know that I probably viewed the experience as being worse than it actually was, but am I wrong? Someone please inform me if I don't understand how Foursquare works. Based on this article about Foursquare, I believe that "unlocked every check-in" means "can be redeemed every check-in", although today I noticed that the store now has a "one per customer!" notice on the Miami indie store's special page. I don't know why I'm so upset. Maybe I'm upset about looking bad in front of others, which is perhaps a form of egotism and self-cherishing. Maybe I'm angry because I feel that this Miami business does not appreciate my money. Is needing to feel appreciated also a form of self-cherishing? Maybe I am too attached to being right or too attached to money. I think the whole problem goes back to a constant battle throughout my childhood and adulthood. I want to feel that life is fair, but the bottom line is that life is never fair. There will always be suffering, and the only way to escape from suffering is to give up materialism, egotism, and delusions. OK, Miami indie store, the lesson is unfortunately learned. Posted as part of: Best Posts of the Week, Haiku Heights, Recuerda Mi Corazon, What the Hell. A nice haiku you have written here. Thank you for sharing. Found without trouble..loved it felt it. Enjoyed your haiku and fully understand your struggle. You've summed serendipity up nicely! I've had a lot of serendipitous moments in my life. I don't think it is too much to expect polite service and gratitude. I also work as a nurse and supervisor and have made me beliefs and expectations very clear to my staff...we are there to serve our clients...if they don't feel this way they need to work in another job that doesn't put them in contact with humans. Your expectations were totally reasonable. Service like you received is one reason so many small businesses go belly up. Long before I got married I went out with a radiologist. He told me that he chose that line of work because he couldn't stand having to talk to people. That was our first and last date. Shockingly, this business has been around for a long time. I'm assuming that service only went downhill recently, but I'm not going to stick around to see if things get better.